The May flower is Lily of the Valley. This low growing perennial plant has small fragrant bell-shaped flowers and two large oblong lanceolate leaves and bloom in white and is very poisonous. Also known as Our Lady’s Tears or Mary’s Tears from Christian legend. It was believed that these names resulted from the Virgin Mary’s weeping during Jesus’ crucifixion. Another legend says they resulted from tears from Eve after Adam pushed her out of the Garden of Eden. In France, Saint Leonard, a brave and fearless soldier, chose to live the life of a hermit in order to spend his days communing with God. The legend says these woods were also where a dragon named Temptation lived. The two had an encounter where the fire-breathing dragon demanded Saint Leonard leave the woods and ended up burning down his hut. Battles ensued and eventually Saint Leonard drove the dragon deeper into the woods until it disappeared. A lot of blood was spilled in these battles and the legend says poisonous plants grew where the dragon’s blood sprinkled the ground and Lilies of the Valley popped out of the ground wherever Saint Leonard’s blood was spilled. An odd legend of sorts when you consider all parts of the Lily of the Valley plant are poisonous. The flower name appears in some translations of The Bible and is also considered a symbol of humility and the sign of Christ’s second coming. The Lily of the Valley is also believed to give men the power to envision an improved world. The German virgin goddess Ostara is associated with the flower and symbolized life to Pagans. The symbolism of humility and pureness is said to be represented in the flower’s white colour and sweet fragrance. The scientific name for the plant is ‘majalis’ which means ‘of belonging to May,’ while the Latin words ‘maius’ (May) and ‘anthemon’ (flower), a reference to when this plant blooms, is how it was named. 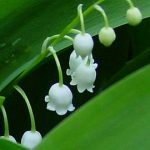 The flower also represents the return of happiness and folklore points to the fondness of a lily of the valley for a bird that returned to the woods in May, when the flower bloomed. Finland adopted Lily of the Valley as their official national flower in 1967 and it has also been the Yugoslavian floral emblem and appears in the coat-of-arms of the Norwegian municipality of Lunner. Recent traditions include selling the flower on international Labour Day (May 1) in France as a symbol of spring. The flower has been used medicinally as it was believed to improve memory and restore speech. It was also said to bring common sense but in order for that to happen, the flower needed to be cooked down into a paste and applied to the forehead and back of the neck. 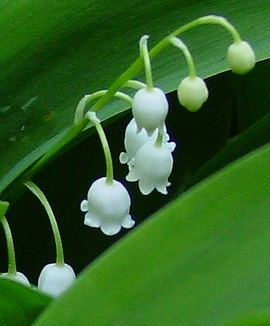 Lily of the Valley also symbolizes sweetness and “You’ve Made My Life Complete” is the hidden message connected to the flower. Looking for more info on the Lily Of The Valley?